Fr. Thomas often receives email asking him about the Orthodox view of redemption including the topics of God's wrath, the payment of a ransom, punishment, guilt, and salvation. Listen to this episode but also refer to his Names of Jesus series where many of these themes are addressed. On this holiday weekend, Fr. Evan digs into his vast backlog of email questions. Fr. 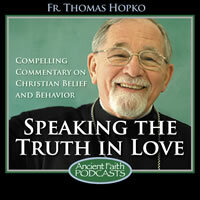 Thomas explains the significance of St. Paul's letter to the Hebrews in our Lenten journey. I continue to receive emails and questions from the listeners of Ancient Faith Radio about that particular aspect of Jesus as our savior and redeemer that have to do with justifying us before God, Jesus as the one who pays the debt that is necessary to deliver us or to ransom us, redeem us from the curse of the Law, from the wrath of God. There’s a great controversy about how that is to be understood and to be explained. And I continue to get questions about it, and it is something that is still very much debated today among Christians, how we understand the death of Jesus on the cross as a kind of vicarious sacrifice or a substitution for us, the one who takes our place before God and makes everything right, makes us right with God according to the law of God, according to the commandments of God, so that we could then be in a good and proper, right relationship with God, and with each other and with the angels and the whole of creation. So, I would just like to reflect on that a little bit more today, perhaps direct those who are interested in this question to my series on Ancient Faith Radio about the names and titles of Jesus according to the Scripture. I have that series of 55 talks about Christ — and by the way, that particular series has to do only with the scriptural and biblical titles of Jesus. Of course, it has to do with how the holy Fathers and the saints interpret those titles, but they are primarily biblical titles and names for Jesus, and for understanding what it means that Jesus is Jesus the Savior, that he is the Christ, that he is God’s Son, that he is God himself incarnate, that he is the Word of God, the Icon of God, the power of God, the sanctification of God, the righteousness of God; I mean, we have that series there, and I would direct the listeners of Ancient Faith Radio to that particular series and particularly to the podcasts that have to do with Jesus as the great high priest, who offers the sacrifice that frees us and redeems us from all our guilt and all of our situation as being sinners in the sight of God, how that is to be understood: Jesus as the great high priest who offers himself as the sacrificial offering that fulfills all the sacrificial offerings of the Levitical code — Jesus’s death on the Cross as a thank offering, a praise offering, a sin offering, a guilt offering, a reconciliation — it would be really good, those who are interested in this subject, I would ask to listen to that podcast about Jesus as the high priest. And then, of course, Jesus also as the Lamb of God, the Lamb of God who is slain, by whose blood we are saved, who has purchased us — you have here also the language of purchase, like ransom and redeem, you pay a price, so Jesus on the Cross paid the price for our salvation, he bought us, so to speak. That language is used in the Holy Scripture. He does that by offering himself as the price, so to speak, the one who fulfills our debt before God and therefore we are freed from all our debts before God, and freed from the wrath of God. how that is to be understood. So, Jesus as the Suffering Servant of God (it’s called often the Servant of Yahweh, the ebed Yahweh) and the most amazing thing about the Christian faith is, that the messianic king, the messianic Lord, the anointed Son of God, who is going to rule over God’s Kingdom forever and ever, whose Kingdom will have no end, is the Suffering Servant, that the Messiah is the one who is crucified, the one who is put to death, the one who is received as a kind of a criminal and dies with criminals, we have to reflect on all of that to understand the depth and the fulness of our Christian faith. But there are also other aspects of this in that series about the names of Jesus: Jesus as ransom, Jesus as redeemer, these are all reflected upon in that series. So I would direct those who are interested in this topic, and people — like I say, I receive quite a few emails on this topic still, that people want to know how we understand that, or how the ancient Church understood it, or how the Eastern Orthodox Church today understands it. Sometimes there are extreme cases, where some people think that all of that language of the Law and being freed from the curse of the Law, and being delivered from the wrath of God, and Jesus giving himself as a ransom and a price of redemption, that that’s not even Christian. Sometimes Orthodox people will say, “Oh, that’s western, that’s Protestant. We don’t have any kind of teaching like that in our Church.” Well, that’s just plain not true! Well, first of all, we’d better have it because it’s in the Bible. It’s a very strong part of Saint Paul’s teaching. If you read the letters attributed to the Holy Apostle Paul in the New Testament, it’s there all of the time, including even the letter to the Hebrews: “he became sin for us…he became curse for us…he was put to death for our sake…he died that we might live.” How is that to be understood? Well, I would just direct your attention to those podcasts. But right now I would just say a little bit about it, again, that hopefully can be helpful, just a kind of brief word about it again. One thing we do want to see is that, when we take all of the witness and testimony to Jesus Christ in the canonical writings of the New Testament, in other words in those writings that the earliest Christians that we identify with (and not only the Orthodox Christians, but Roman Catholics and Protestants traditionally identify with) the 27 writings of the New Testament. When you take those 27 writings of the New Testament, and you look at them, and you try to synthesize the teachings that you find there, very often in schools (you know, I used to be a school teacher at the seminary) the way that we would try to contemplate or understand this particular aspect of the Christian faith is, first of all, to say that every one of the ways in which Jesus saves us is connected to all the other ways. And the ultimate saving act of Christ, the ultimate act of salvation and redemption, deliverance from evil, freedom from the curse of the Law, freedom from being held by the demons, and freedom from the ultimate enemy and the destruction of the ultimate enemy, which, according to the Apostle Paul is death — all these different ways in which the New Testament writings, interpreting the Old Testament, speak, we have to remember, they’re all related to each other. You have a kind of a synthesis of them all; they’re different aspects of what Jesus of Nazareth — who is the Christ — what he does in order to save us so that we could call him our savior. And you might, of course, even listen to the podcast in the series about the names and titles of Jesus, “Jesus as savior”, “Jesus as redeemer.” Well, these all go together. Jesus saves us by being the messianic teacher — the final prophet — by revealing the truth, by being himself the truth — “I am the truth,” he says — by being himself the light that delivers us from not only the darkness of death but the darkness of ignorance, of foolishness, of stupidity, of not knowing what the meaning of life is. Jesus as the Logos, the Word of God incarnate, who not only pronounces the teaching of the truth, and teaches and reveals the ultimate mysteries of God on the planet Earth in what he teaches, but also in what he does and in who and what he is as the Logos Word of God. And then Jesus as the Wisdom of God, who delivers us from foolishness and nonsense and just being — how can you say — duped by the lies of the devil and the lies of the world; Jesus, who really shows us what the truth is, speaks about it, and accomplishes it in his life, especially in his passion and death on the Cross. So you have that, what sometimes is called the first model of salvation, of: Jesus saves us from stupidity, he saves us from unknowing, he saves us from ignorance, he saves us from foolishness, he saves us from the lies and the deceits that are on the Earth about what human life is really all about. And he reveals to us God himself, the true God. He reveals the ultimate mystery, so that we have insight into all the wisdom and knowledge of God. Saint Paul says that in him are all the treasures of wisdom and knowledge. So that’s a way that he saves us. If we say to God, “Oh, God, save me from foolishness! Don’t let me be stupid! Let me understand things properly! Let me know what life is really all about! Don’t let me be a victim of the deceit of the devil or of other human beings, or of my own fallen…you know, what I inherit as a person born into this fallen world! Illumine me! Enlighten me! Give me insight! Make me wise! Make me enter into…in a sense, even, to become a prophet with Jesus, to be a prophetic person who can know the will of God!” So, it has to do with knowledge. That’s very important. And then you have another model, so to speak, that we’re going to talk about, and are directly addressing right now, and that is Jesus as the redeemer, the ransom, the one who pays the price for our redemption, the one who delivers us from the curse of the Law, the one who makes us right with God, so that we’re not alienated from God anymore, that we are accepted, and that everything is made right in him. And that is sometimes called the priestly model, or the high priestly model. The first would be called the prophetic model, the messiah as prophet, the last and final prophet, the revelation of the truth. And then you have Jesus as the great high priest who offers the perfect sacrifice in his own body on the tree of the Cross, giving himself into the hands of God on the Cross, and thereby paying the debt that we owe, in order to be delivered from the curse of the Law. In other words, to overcome our guilt. So, Jesus as the high priest offers himself as the guilt offering. And in some sense there’s a kind of legalistic dimension to this understanding, that, by failing to fulfill the commandments of God, the ordinance of God, the statutes of God, the words of God — all those elements that have to do with commandments and statutes and words and teachings and ordinances — he fulfills all that in his human life; the Son of God incarnate fulfills all that, and he does it by dying on the Cross, and he does it for us. He does it in our place, so to speak, where we don’t have the ability as fallen, sinful human beings to redeem ourself: we cannot redeem ourself from ignorance, we can’t redeem ourself from our sinful state, we can’t redeem ourself from death, as we’ll see in a minute here, too. Only God can ransom us, only God can redeem us. But the redeemer has to be a human being, a new Adam, who brings to the world the human life the way the life ought to be when the commandments and the teachings and the statues and the ordinances and the laws of God are fulfilled. And Jesus does this, and that’s an aspect of him as our savior, our redeemer, the one who makes us one with God. Other words here would be reconciliation: he is our reconciliation; God was in Christ reconciling himself with us and us with him, and not only reconciler, but the one who crosses out the handwriting against us according to the Law, so that we are no longer held by our sins; we’re delivered from our sins. So he does that in his death on the Cross as the great high priest who offers himself as the sacrificial victim, the Lamb of God, fulfilling all the sacrificial prototypes in the Old Testament, in the book of Leviticus, and therefore making everything right, making us right with God, and therefore the Law of God is no longer against us. Now, how do we understand that? How do we explain what that is, how it works? And here, again, I would recommend that you go to the series on the names and titles of Jesus and read the pertinent podcasts on that subject. But just for now, I would say, once again — to try to help us, and try to to be illumined and understand the truth about how this works — what we would have to say here, is, that how the Scripture is to be understood on this particular point seems to be the following: we might begin by saying what it is not. And here, I think, is a great area of controversy among Christians, because some Christian believers say that Jesus, on the Cross, had to be punished for the punishment that we have to pay for being sinners. In other words, we deserve to be punished. If we’re judged according to the Law of God, we’re guilty, and therefore we have to somehow do what is necessary to get that guilt off us, and what that usually is understood, is, being sufficiently punished for the sins that we have committed. But then, it would be claimed that we’re incapable of offering sufficient suffering, and our punishment cannot do the trick; our being punished by God cannot ultimately save us, because we have sinned against God and, therefore, if our sin is a sin against God, then the only way that we could be redeemed and have a ransom paid that would be sufficient to work, would be to have a divine punishment. It’s like, you commit a crime, well, you go to jail. You commit a crime, or, I don’t know, you receive thirty lashes and then, once you get them, you know, then you could be let go. Ransomed means to be let go, to be freed, like you’re in jail and you’re set free, or, you’re under the curse of the Law and you’re set free, because the price of the Law has been paid. But if the sin is against God, we can’t pay it, because we’re not divine. So the teaching would be, God so loved the world — and it’s an act of love, we should be clear, it’s an act of love — that God so loves the world that he sends his Son to bear the punishment that’s due to every single human being in the whole of humanity that has sinned against God. So, on the Cross, you get the sufficient sacrifice. The perfect punishment is — and so, Jesus, as the Lamb, is a lamb, who is punished, who is beaten, slain, killed even, because — let’s take for example, that as an example: if a person has killed someone, the claim would be that, if they get killed, then they’re free from the law, because they’ve paid the price for their murder, and that would be like law for, eye for eye, tooth for tooth. And here, sometimes, people even think that, if one person kills another person, and then they get killed, and have like capital punishment, then it’s ok, then they’re set free because they have paid a sufficient price with their own life, because they have taken a life. Now, here, I think that this would not be a Christian teaching — I really don’t think that this is a Christian teaching — that, if I kill somebody and then I get killed, everything will be ok. And sometimes even our politicians speak this way, like killing Osama bin-Laden. Well, Osama bin-Laden was guilty for killing lots of people, but when our SEALs went in there and found him and shot him to death, and his son also, and other people, now everything’s ok, everything’s made right now, we killed Osama, everything’s alright! Well, that would be really a terrible thing to imagine. So, punishment is not a way to make things ok. Jesus on the Cross is not sufficiently punished so that God’s wrath could be satisfied, his Law could be completed, and, therefore, we could be forgiven the sins that we have committed, because Jesus had paid the punishment for all of the sins that we have committed. I would submit, that the Holy Scripture teaching, and the Christian teaching, doesn’t have to do with punishment. There’s no amount of punishment that we could take that would be sufficient to reconcile us to God. And God doesn’t send his own Son to be sufficiently punished so that his wrath could be satisfied and his anger can be put aside, and then he could love us because his Son has endured sufficient pain, because God wants that pain and he needs to have that pain for his Law to be fulfilled. That’s a terrible teaching, actually. I mean, it’s monstrous, almost, to think of a god that would be like that. A god who would say, “Ok, I can’t punish you enough, and therefore I can’t let you into eternal life, because you’re guilty and you can’t pay the proper price. So, I love you so much I’m going to send my Son and beat him up and have him reviled and mocked and scourged and spit upon and nailed to a cross and die, and then he’ll get sufficiently punished and then I can let all the rest of you go, because of the blood of my Son.” I just think that that’s not the proper explanation, and that’s not a very good explanation, and has a very very ugly vision of God, if that would be the case. So, what would be the teaching? Well, it seems to me, the teaching is this: the only way that we can be made right with God, is when you have a human life, a perfect life, that is not sinful at all. The Law of God, all the commandments of God, according to Scripture — both Old and New Testament — are fulfilled in the two commandments of the Law that are mentioned several times in Jesus’s teaching and his interaction with the people when he was on Earth. The first is to love God with all your mind, soul, heart, and strength, and to prove that love for God by the love of your neighbor, including your worst enemy, including those who are beating you and reviling you and persecuting you, loving them and doing no evil and no sin against them at all. So, love is the fulfillment of the Law. Saint Paul even writes, he says, “Owe nothing to one another except to love one another, the debt” — and debt means what we owe, what we ought. What we owe is righteousness. What we owe is fulfilling the commandments. What we owe is to live according to the faith and grace and obedience to God himself. And none of us do that. When we don’t live in perfect love for God and our neighbor — and love for our neighbor and worst enemy proves our love for God — then, what comes upon us, the wages of sin is death, and we die, and we’re caught by the hands of the devil, and we cannot live, and the wrath of God is upon us because we are failing in love. So, I think that the way we would understand this is that, God so loves the world that he sends his only begotten Son, born of the Virgin Mary, to become a real human being — and Jesus really is a man; I’ve gotten complaints from some of the listeners that claim I’m a heretic because I call Jesus a man, and they say he’s not man, he’s God. God made man, but he’s not a man. Well, the Scripture speaks about him as a man, and the Holy Fathers and the councils speak about Jesus being divine with the same divinity as God his Father, and human with exactly the same humanity that you and I share. He really becomes human. That’s what the creed says; that’s what the Scripture teaches. But he becomes a human for what? Well, if we put it in the light of this question: to free us from the curse of the Law, to pay the price necessary to ransom us from guilt and our sin and death itself, how does he do that? Why does his death do that? And here, I think the answer would not be because he paid sufficient punishment that’s due to us, so he’s punished in our place, like a substitution, or a vicarious sacrifice; he suffers the punishment that is due to us, and then that makes God happy, it makes God satisfied, he can let us go and we’re saved. No! What seems to be the teaching — and here we each have to read the Scriptures and follow the Church teachings and the councils and the Fathers to try to understand this properly — what seems to be the teachings is that he loves perfectly, he fulfills all righteousness, he fulfills all aspects of how we ought to relate to God properly. When we are fallen into sin — and God gives us the Law of Moses that is a pedagogos, a teacher to the coming of Christ — he fulfills all of the teachings of the Torah of Israel. He’s born into the world, he’s offered in the temple, he’s circumcised on the eighth day, he keeps the Law perfectly. It’s his perfect keeping of the Law, which is ultimately perfect love for God and neighbor, that is what redeems us. That is what is going to remove the wrath of God from us, because, if you have an Adam, a real Adam, a real human being, who really is God’s Son and lives like God’s Son, which we were all created to do — Adam and Eve, they were created to be children of God. Adam is called Son of God in Scripture. He was created to be really what God is by grace, and he failed through sin. But when he fails through sin, the way he gets forgiven and redeemed is not by offering sufficient punishment and pain according to the sins he has committed, it’s, rather, that he is saved by one who keeps the Law, who does the commandments. And it’s interesting, that in Orthodox Church Holy Week, over the tomb of Jesus, when he lies dead in the tomb, is the 118th/119th Psalm, the real long one about the commandments, the ordinances, the statutes, the words, the laws of God that are kept by Jesus that then save us and redeem us from the curse of the Law. Because the curse is lifted for what reason? Not because sufficient punishment was made, but the curse is lifted because righteousness has been effected. You have a sinless life. You have a sinless messiah, taking on himself the sin and curse of the world, so that God’s wrath would not directed against us again, if we offer it to God, and he offers himself on our behalf to God, and we say to God, “Lord, we’re sinners. We’ve broken all the commandments, but our messiah, our Lord and Savior Jesus Christ has fulfilled all the commandments. He has done this for us and for our salvation.” That’s why he came into the world. So, when he says to God his Father, “Let this cup pass,” or “Why have you abandoned me?” (or “forsaken me?”) he also says from the Cross, “Abba Father, into your hands I give my life, I give my spirit.” And then, when he’s abandoned by all the people, including his own people, including even his own apostles and so on, he says, “Abba Father, forgive them, for they know not what they are doing.” So, Jesus on the Cross is the perfect lover. He’s the perfect human being. He’s the absolutely sinless man and therefore he is that one man, that new Adam, who comes from heaven to fulfill the Law of God in our place, so that in and through him and by faith in him God will consider us righteous before himself, because we do finally have a human being, an Adam, that we can live according to him and therefore be delivered from the curse of the Law and the wrath of God. So the wrath of God is off us because of the righteousness of Christ, because of his fulfillment of the Law. That’s what the high-priestly model of redemption means: he ransoms us from the curse of the Law, from the judgements of the Law, from God’s wrath that we are sinners before the Law, by keeping the Law, by keeping the commandments perfectly even when he is abandoned, delivered, forsaken, beaten, persecuted, whipped, ravaged, ridiculed, denied, betrayed, and given over unto death voluntarily, which he does, in order to redeem us. And here, the third model of redemption would be, you have the model of the king destroying the enemy: the messiah is the messianic king. He’s not only the messianic prophet and the messianic high priest and the messianic victim, but he is the messianic king; he is the anointed Son of God, he is the king of God’s coming Kingdom. And God has made him the king over all things and the judge over all things because he is the Son of Man and has never sinned. Read the letter to the Hebrews. That’s what that letter is all about. As the great high priest, he offers himself to the Father, he enters the Holy of Holies not made by human hands, and as the pioneer and forerunner of our salvation — the expiation, propitiation of our sin — without sinning, he endures all the consequences of sin, (and the ultimate consequence is death itself,) in order then to ransom us from death. It’s interesting that the Holy Fathers like Gregory the Theologian, Saint Basil the Great, when they reflect on this, Gregory the Theologian will say, “To whom did Jesus pay the price to save us, and what is the debt that is paid?” And Gregory says, “Does he pay off God the Father?” And Gregory says, “No! The Father’s not holding us.” God the Father didn’t even want Abraham to kill Isaac. He tested him in the binding of Isaac, but he doesn’t let him die, he send his Son to die. But God isn’t, some kind of, holding us and he won’t let us go until his wrath is satisfied by our being sufficiently punished. You could say that we are under the wrath of God as long as the Law is not fulfilled, but Christ comes and fulfills the Law on our behalf and in and through him, therefore, we are made righteous with God. Or, to use the Pauline language in English translation, we are justified, we are justified by the death of Christ because he fulfills the Law. So, this is how Gregory says it, he says, “Is the debt paid to the devil?” Gregory says, “Fie upon the outrage!” (Old English translation.) The devil shouldn’t be paid off, the devil deceived us, he tricked us, now we’re going to trick him: the devil’s going to take Jesus thinking he can destroy him and it’s the devil who’s going to be destroyed. Like we sing in church on Passion Week, “the deceiver is deceived and by that deceit, we are liberated, we are set free.” But, then, what does Gregory say? He says, “What really has to be satisfied is the fallenness of our human condition.” In order for everything to be made right, to be satisfied, to be what it’s supposed to be, we need a man who keeps the Law and lives all righteousness no matter what and even in the fallen world takes upon himself the sins of everyone and everything in order to expiate and propitiate all reality before the face of God. And that’s what Jesus does. So, Saint Leo the Great, the Pope of Rome who wrote to the council of Chalcedon, after Gregory lived and Basil lived, he said, “He paid the debt to our condition.” That’s a nice expression, I like it. Our condition is cursed, sinful, and dead, so he takes the curse, he takes the sin, he dies the death, and therefore the debt is properly paid. He does all of this by perfect love and perfect righteousness and absolute innocency, and, therefore, we are delivered by it. But again, it’s not by being sufficiently beaten up and enduring enough pain so that God can then let us go. That’s not the teaching. In our worship of the Saint Basil liturgy, we have a very clear statement in the eucharistic anaphora where it says that, having become human — the Son of God becoming the son of man in Mary and taking on himself the sins of the world and being the Lamb of God — the liturgical text says this, these are the exact words, “He gave himself as a ransom unto death by which we were held captive, sold under sin.” He gave himself as a ransom unto death. So, it’s not unto God, it’s not unto the devil, it’s unto death, which is the same thing Leo was saying when he said “our condition.” What is our condition? It’s wretched, cursed, sinful, and death and under the wrath of God. So, he takes all that upon himself, and by fulfilling all the commandments — and ultimately all the commandments are fulfilled in love, so as Saint Paul says, “Owe nobody anything except to love one another.” What can we give to God for what he has given unto us? Nothing, but to love him, to love him for creating us, to love him for redeeming us, to love him for forgiving us, to love him for delivering us from the hands of the devil and all evil beings, to deliver us from ignorance and stupidity and foolishness, to deliver us from everything that is ungodly and to deliver us from the ultimate effect of all sin, which is death itself. So, you have the messianic prophet and the messianic high priest — Jesus — is also the messianic king and he dies for his subjects; he dies for his people. He gives his life on their behalf to God the Father, and he does this in perfect love for God and for all creation, and for us sinners. While we’re still sinners, he loved us; while we’re still sinners he gave himself for us. And then, this act, therefore, destroys the devil himself; it delivers us from the hands of death and the devil himself. So, the way that is understood, (and this is very classical in Christian teaching; Martin Luther and others held this teaching as well) is that, when life — Jesus says, “I am the life” — when he dies on the Cross, life destroys the death; he tramples down death by his own death because his death is an act of life. When the Christ enters into the darkness of sheol and death, the light destroys the darkness. You know, if you’re in a room and it’s dark and you turn on the light, the darkness is overcome. If you’ve got a situation where there is sin and then perfect righteousness enters, it’s the sin that is destroyed. If you’ve got a situation of foolishness and nonsense and truth and light and wisdom enter, the foolishness and the nonsense is destroyed, it’s overcome, there’s a victory. And that’s why Jesus destroys the death — also, we can speak of how he redeems us — by being the king. He delivers us, redeems us, frees us, saves us, makes atonement, reconciles us by being the perfect truth, the perfect prophet, the word of God, the wisdom of God, by being the perfect king, the one who loves, and loves until the end and takes upon himself the sins of the world. And then he saves us also by being the perfect sacrifice that’s offered once and for all, according to Scripture; it’s not repeated. When Jesus dies on the Cross in the perfect act of love for God the Father and for us human beings and for the whole of creation, then we are redeemed, the price has been paid. We are bought by his blood — his blood means his life. He gives his body even. He offers his body to the Father: his body and blood to be broken and shed, and that’s an act of love, and that’s what redeems us, that’s the debt that is paid. What God wants from us is not sufficient punishment and suffering for our sins. What God wants from us is perfect righteousness, perfect holiness, perfect goodness, absolute innocency, that we would really follow his commandments perfectly, all of which are fulfilled in love, and that’s what the messiah does, and that’s why he’s our redeemer, and that’s the debt that he pays. He gives his own life in an act of love, in an act of perfect sinlessness, and that redeems us. God accepts that, and then you can say he lets us go, that for the sake of Christ, God will let us go. He will deliver us from, not only our stupidity and ignorance, not only from being held by the prince of this world, who is the devil and his angels, but God delivers us from the guilt of our own sins. The guilt is washed away, the handwriting against us is erased, as it says in Scripture, and we are set free and we are saved. So, I think this is how we put all of that together. But the debt that we pay, the debt that we owe is the debt of love. It’s not the debt of being sufficiently punished and suffering enough, and if we’re not suffering enough in our life we can go to purgatory or we can cash in on the merits of the Saints, or something. That’s not the Christian teaching. God wants perfect love and perfect truth and perfect righteousness. We can’t give it, Christ comes and he gives it for us and for our salvation. He does it in our place, so there is a substitution; he satisfies the conditions of being in communion with God, so there is a satisfaction. And that satisfaction, it does remove the wrath of God, and we’re no longer considered guilty because the Law has been fulfilled. If the Law has been fulfilled, then there can be no charges made, and so Christ fulfilled the Law for us, and therefore the charges against us are taken away and we are set free. So, it seems that it’s somehow in this way that all of this is to be understood, but let’s keep working on it, and let’s keep going with it. But I would suggest to those who are particularly interested in this topic, please do go to the 55 talks on the names and titles of Jesus in Scripture, and listen to those that have to do with him as savior, redeemer, ransom, Lamb of God, propitiation, expiation, great high priest. And then hopefully we’ll have some insight into the mystery of why it is that the death of Christ on the Cross and his passion is not only the destruction of the devil and death, it is not only the revelation of ultimate truth and wisdom of God, but it is also, the price is paid, the ransom is given, expiation is accomplished, and we are set free by his death on the Cross, not because it is sufficient punishment, but because it is more than sufficient love.